The Orbitor features new technology that eliminates the struts of a sprinkler body to provide outstanding uniformity and optimal droplets at low operating pressures. Designed with an innovative, bracketless assembly, debris hang up and water pattern misting common to conventional sprinklers are mitigated. 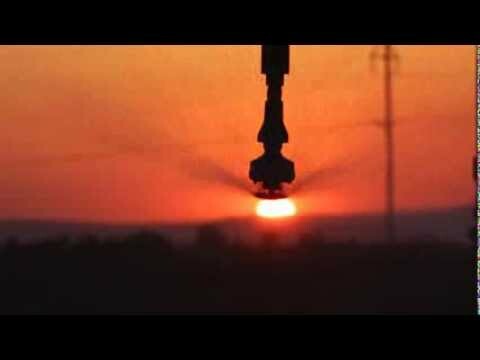 Irrigators can expect long wear life, reliable operation, and durability, even in the toughest water conditions. The Orbitor is streamlined for excellent movement through canopy and over field obstacles. This off-axis sprinkler replaces the old-style Nelson N3000 Nutator. The Orbitor is available with the choice of three different plate options to meet specific irrigation needs. The standard angle BLACK PLATE has 9 grooves for optimum uniformity and maximum throw. The low angle BLUE PLATE has 9 grooves and provides maximum wind-fighting ability. The new PURPLE PLATE delivers a consistently smaller droplet — ideal for germination of crops and soils requiring finer droplets. We are pleased to offer the plastic-cover version of the Orbitor. This sprinkler does not have the weighted cover like the initial product offering. This makes it a great retrofit option for systems that already have poly weights. It requires 3/4” NPT threaded weights only. Do not use any other slip weights. Pressure regulate to 10 psi (0.7 bar). The Red Plate for the Spinner offers cross-product versatility as it can also be used with the Rotator®. Its low stream height provides gentle, high uniformity water application. The Up-Top Lime Plate is for use on top of the system pipe for increased throw and minimal crop interference. The Purple Plate for the Spinner creates gentle water droplets that allow for peak performance in specialty crops and unique soil conditions. The Yellow Plate for the Spinner features multi-trajectory streams making it the premier wind-fighter of the Spinner family. The larger droplets at higher trajectories protect the finer, lower trajectory droplets from misting. The Beige Plate for the Spinner is a specialty plate that creates one main stream for use with small nozzles near the pivot point to prevent over-watering. It should be used on flexible drops, or those with at least 1ft. (.3 m) of hose. The Blue (low-angle) Plate for the Orbitor has 9 grooves and provides maximum wind-fighting ability in an off-set axis sprinkler design. The unique body of the Orbitor reduces droplet breakup, drift and drool contributing to exceptional uniformity. The Black (standard angle) Plate for the Orbitor has 9 grooves for optimum uniformity and maximum throw in an off-set axis sprinkler design. The unique body of the Orbitor reduces droplet breakup, drift and drool contributing to exceptional uniformity. The Purple (fine droplet) Plate for the Orbitor has 18 stream grooves for a consistent fine droplet pattern from an off-set axis sprinkler design. The unique body of the Orbitor reduces droplet breakup, drift and drool contributing to exceptional uniformity. The Maroon Plate for the Accelerator has a lower low stream height than the Gold Plate and provides more wind-fighting characteristics. The Accelerator functions like a low pressure Rotator® and greatly outperforms over a Sprayhead with greater throw and higher uniformity. The Gold Plate for the Accelerator provides a superior throw diameter, providing a lower application rate and longer soak time for better infiltration and reduced runoff. The Accelerator functions like a low pressure Rotator® and greatly outperforms over a Sprayhead with greater throw and higher uniformity. The Navy Plate for the Accelerator provides the benefits Rotator® Technology at lower pressures in an up-top design. It greatly outperforms over a Sprayhead with greater throw and higher uniformity. The Turquoise Plate (with smooth surface) for the Sprayhead is ideal for germination because it creates a canopy of very fine droplets. It’s easy on the soil but has limited throw radius and is susceptible to wind drift effects. The Green Plate (concave trajectory with 30 fine grooves) for the Sprayhead is good for germination and plant emergence as well as applications on sensitive soils and crops. It has a limited throw radius and is susceptible to wind drift effects. The Yellow Plate (flat trajectory with 30 fine grooves) for the Sprayhead is good for germination and plant emergence as well as applications on sensitive soils and crops. It has a limited throw radius and is susceptible to wind drift effects. The Blue Plate (concave trajectory with 36 medium grooves) for the Sprayhead has a wide throw for the Sprayhead family with good wind-fighting ability. The Black Plate (flat trajectory with 36 medium grooves) for the Sprayhead has the same spray pattern as the blue Plate but a flat trajectory. It has wide throw for the Sprayhead family with superior wind-fighting ability. The Gray Plate (flat trajectory with 24 coarse grooves) for the Sprayhead has aggressive streams and good sized droplets for good wind resistance. The Orange Plate (multi-trajectory with 21 coarse grooves) for the Sprayhead has the most aggressive streams in the Sprayhead family which create large, wind-fighting droplets. The Brown Plate (multi-trajectory with 33 medium grooves) for the Sprayhead has the widest throw distance for a Sprayhead. The multi-trajectory design reduces stream collision and provides better overlap. Sprinkler Irrigation Uniformity is how evenly a set of sprinklers delivers water over the soil within the sprinkler’s effective throw diameters. The higher the uniformity, the more even the water application is, and results in all of the plants receiving very similar amounts of water. Lower uniformity numbers create more areas which are too wet or too dry. Consideration of a sprinkler’s throw diameter is essential. The larger the throw diameter, the lower the application rate at a given flow, insuring less runoff and lower erosion rates. A good design will match the application rate of the sprinkler with the infiltration rate of the soil. The throw diameter is also critical in determining spacing requirements. Generally, sprinklers need to overlap 150% to assure uniform application. Additional overlap can help raise uniformity further. Stream height is the peak height above the sprinkler of the major droplets emitted from a level sprinkler under no wind conditions. Higher stream heights are effective for achieving longer throw diameters but can suffer from evaporation loss and distortion in areas of windy conditions. Higher stream heights require mounting height considerations to avoid issues with structure interference. Lower stream heights are more effective in delivering water in windy conditions with less evaporation loss but sacrifice effective throw diameters. Uniformity values indicate the lowest predicted Christiansen's Uniformity, CU, at any spacing within Nelson Irrigation Corporation’s recommended limits of the sprinkler at the indicated crop clearance. High values indicate that the product can be used with relative safety throughout the spacing range. Application of the product in conditions for which the tabulated values are lower may require additional analysis to determine the most advantageous spacing. Nelson Irrigation Corporation makes no representation regarding droplet conditions, uniformity, or application rate. Height values shown indicate the maximum height of major droplets emitted from a level sprinkler under no wind conditions. Sprinklers should be mounted at least this far below the pivot structure to minimize wetting of the structure, but they may be mounted slightly higher without significantly affecting the sprinkler pattern. Nelson Irrigation Corporation makes no representation regarding droplet conditions, uniformity, or application rate. Stated throw performance at nozzle pressure. Tested at 1250 feet above sea level. Sprinkler performance data have been obtained under ideal test conditions and may be adversely affected by wind, poor hydraulic entrance conditions, or other factors. Nelson Irrigation Corporation makes no representation regarding droplet conditions, uniformity, or application rate. This clip allows your 3000 Series Pivot sprinkler to have an additional nozzle on board to precisely match crop water requirements. This clip allows your 3000 Series Pivot sprinkler to have two additional nozzles on board to precisely match crop water requirements. Benefits of pressure regulation include a uniform depth of water application, controlled sprinkler performance (droplet size and throw distance), and flexibility in system operation. Use the Part Circle Spinner with Spinner or Orbitor packages to help keep wheel tracks dry.